The inimitable Bryan Cranston joins Larry for an intimate conversation about his approach to acting, his uncensored thoughts on Donald Trump, and his unlikely path to ‘Breaking Bad.’ Plus, the Academy Award nominee on his decision to join ‘Power Rangers,’ why he wants a ‘Malcolm in the Middle’ reunion, and his surprising secret talent. ‘Breaking Bad’ star Bryan Cranston talks to Larry King about how he came to be involved with ‘Breaking Bad,’ his tendency to play real people, and comments on the current political climate, including his strong opinions on both gun control and Donald Trump. Cranston tells the story of his first time working with ‘Breaking Bad’ creator Vince Gilligan, and how that lead to Gilligan championing him into the career-defining role of Walter White. Cranston discloses that the key to his success in playing real people is not through imitation, but rather being “able to get just the essence of them.” He maintains that family has been an integral part in getting to know each real character he’s played. Cranston makes his less-than-favorable opinion of Donald Trump clear, claiming that Trump “wants the title of president, but he doesn't want the job of president.” Cranston also expresses his stance on gun control and his disbelief that little has been done to prevent potentially dangerous individuals from buying deadly weapons. "It's always story first. If I'm stimulated by the story, if it resonates to me as being an honest display of events, that's what gets me… And then, through osmosis almost, the character starts to come to you, you start to think about it, and that's always a good sign to me. That I'm onto something that means something to me, and hopefully to an audience." — Bryan Cranston on how he chooses his roles. “Every time I go into that I tell myself I'm not here to do an impersonation of this person, I want to be able to get just the essence of them, the sensibility of them, and the way in, often is through family.” — Bryan Cranston on the process of playing real people. "That part was easy actually, the idea of taking on different personas and characters. But if I make a mistake, we shoot the scene again, if Bob Mazur made a mistake, they shoot him." — Bryan Cranston on playing an undercover agent in ‘The Infiltrator’. "I have sort of a layman's, a blue collar, approach to the work, I never ascribe to any one particular teacher's philosophy, I didn't feel like that was appropriate. I just wanted to glean as much as I can from as many people as I can, so I read copious amounts of books on acting and took a tremendous amount of classes and just kept pulling and pulling." — Bryan Cranston on his acting method. "I get this call, Vince Gilligan wants to see you for Breaking Bad. I go I don't even know what that is, I don't even remember what he looks like, but I'll go in. And I read it, and it was the best hour long script I've ever read, and I knew I wanted it. So I went in there and lifted my leg and put my scent all over Vince Gilligan so that he would only think of me for that role, and he was my champion to get that part.” — Bryan Cranston on how he got the part of Walter White on ‘Breaking Bad’. "I just don't understand why an average citizen is allowed to have a military-grade weapon that can cause massive destruction. You know, how much is enough? What's the number where people say ok, that's enough, we've reached our quota of unnecessary killings, so now we should have some sensible gun restrictions?" — Bryan Cranston on the lack of gun control in the United States. "Now, I personally, love to shoot a gun. It's fun, it's skillful. I have no problem with people wanting to protect their family, I have no problem with any of that. It's just that so you don't think that someone who is on a watch list should be restricted from buying a gun until we clear that person? You don't think that a person who has spent time in psychiatric wards should be prevented from... you think that anybody walking into a gun show should be able to walk out with a gun, without doing a background check?” — Bryan Cranston on the lack of gun control in the United States. "I think he is like a huge cargo ship, massive, commands attention, demands it, his wake leaves tremendous problems, his displacement of water is enormous, and yet you go into the cargo hold and you go, hello, hello, it's empty, there's nothing there. This is a man who desperately wants to win that position, he wants the title. He wants the title of president, but he doesn't want the job of president." — Bryan Cranston on Donald Trump. 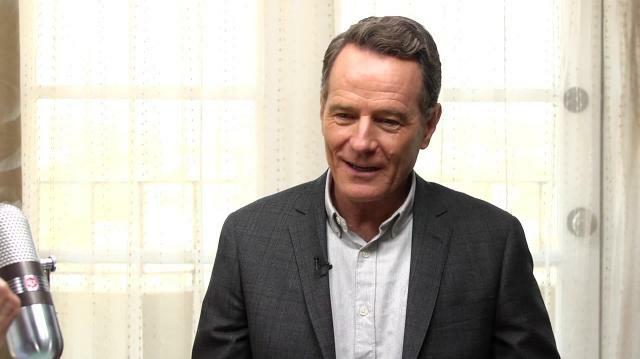 "I am probably like, the best, dishwasher loader around.” — Bryan Cranston on his secret talent. "I meet people on the street and they want to talk about me, and I'm bored with that subject." — Bryan Cranston on fame. "I just wanted to be a good working actor, I wanted to say that I make my living as an actor and that happened when I was 25…and I put of a lot of resistance to oh he's a television star or he's becoming a movie star, it's like oh no no no, because my goal was just to be a working actor.And I've since stopped putting out so much energy resisting what other people see me as, so I just try to say thank you and move along." — Bryan Cranston on his success as an actor. “If you become famous, then you cease to be able to be the observer because you become the observed. And that kind of puts up a little bit of a wall, like oh people are all looking at me and I can't do that part of my job anymore." — Bryan Cranston on the downsides of fame.